Philadelphia chromosome; three-panel drawing shows a piece of chromosome 9 and a piece of chromosome 22 breaking off and trading places, creating a changed chromosome 22 called the Philadelphia chromosome. In the left panel, the drawing shows a normal chromosome 9 with the ABL gene and a normal chromosome 22 with the BCR gene. In the center panel, the drawing shows chromosome 9 breaking apart in the ABL gene and chromosome 22 breaking apart below the BCR gene. In the right panel, the drawing shows chromosome 9 with the piece from chromosome 22 attached and chromosome 22 with the piece from chromosome 9 containing part of the ABL gene attached. 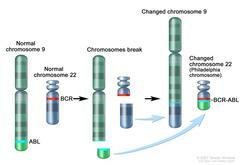 The changed chromosome 22 with the BCR-ABL gene is called the Philadelphia chromosome.